APUC kicked off Wednesday morning with an exceptional array of presentations from some of the ‘who’s who’ in the global GIS community. There were compelling user presentations (such as Singapore Land Authority and Downer New Zealand), and leading technology experts (such as 3D king Eric Wittner). And APUC attendees even got the world’s first look at what’s coming in ArcGIS 11. But for me – there were three highlights in particular. 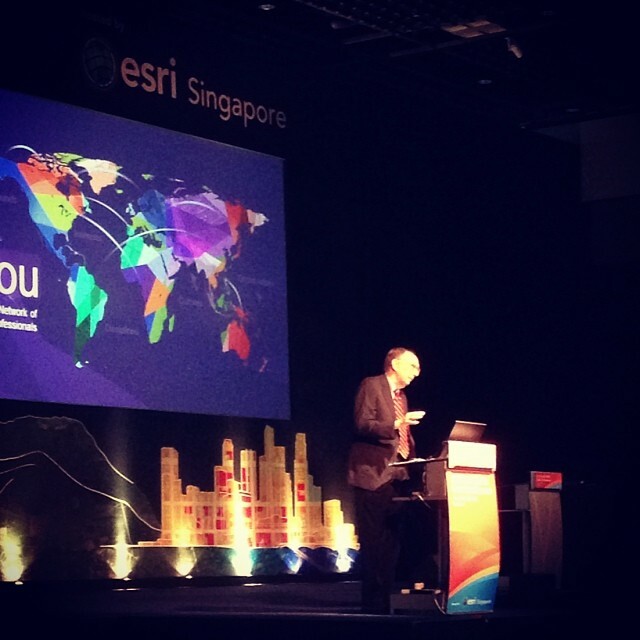 Firstly, the plenary began with a moving address from Esri Singapore Managing Director Leslie Wong, who spoke about what makes Asia special and unique – its resilience against adversity. Leslie reflected how in recent times, Asia has suffered some of the world’s most devastating natural disasters, including last week’s Philippines Typhoon, and the 2011 Japan Tsunami. What makes the region unique is the way it responds and recovers from these crises. Leslie spoke of an overwhelming sense of resilience amongst the Asian people – and a real ability to prevail over adversity. He said this same strength of character translates into what the region is achieving with GIS. As IT professionals, the Esri Asia Pacific User Community has the GIS skills and tools on hand that are helping deliver some truly extraordinary projects across the region. Leslie then introduced one of the region’s most progressive users of GIS technology – APUC’s keynote speaker – Chief Executive of the Singapore Land Authority, Mr Vincent Hoong. Mr Hoong’s presentation was fascinating as it highlighted for me how fundamental GIS technology is across all facets of the work his agency undertakes. He conveyed that geospatial analysis is a growth area not only for the SLA, but for all of Singapore. One example he gave of this is OneMap – SLA’s ‘one stop’ geospatial platform for agencies. When the platform launched in 2011, it featured 40 information types from 20 agencies. Today there are 69 information types sourced from 36 agencies. Mr Hoong said key to this growth is the fact that geospatial content is now recognised by the Singapore Government as key for effective decision-making. 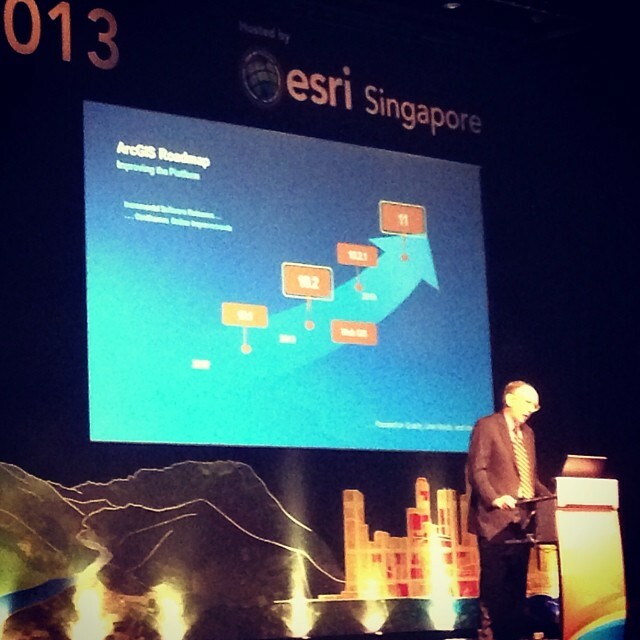 The other highlight from the plenary for me was – of course – the address from Esri Founder and President Jack Dangermond. Jack started by reflecting on some of the great work being conducted in the Asia Pacific – from Australia, to the Philippines, and to Japan. He then went on to discuss the evolving role of GIS and how it will be pivotal in securing a better future for the region. Our society is facing unparalleled challenges – he cited the effects of climate change as just one example. He posed the question – will GIS keep up with the challenges of climate change? He said the simple answer is ‘yes’. GIS is going through a transformation that will allow us to accelerate its use through society. Key to that is how traditional GIS is changing to become a ‘Web GIS’. That’s not just a Desktop GIS; not just a Server GIS; it’s an entirely new pattern. Web GIS leverages the Cloud, real-time data, big data – it integrates 2D into 3D. Importantly, Web GIS supports two key user groups – traditional GIS users and the new business user (who Jack also calls knowledge workers). Through making geographic analysis more accessible to these new users through Web GIS, it will become pervasive to all that we do. Finally – Jack gave us a sneak peek at what’s coming next with the technology – ArcGIS 11. It’s going to be much faster – with 64 bit processing, it will be the fastest, most responsive spatial technology ever invented. It will have unified 2D and 3D viewing and there’ll also be composite feature creation – so users can create multiple features with a single click. There is some seriously cool stuff coming – and we got to see it here first at APUC! This entry was posted in Events and tagged APUC 2013 on November 14, 2013 by Esri Australia. 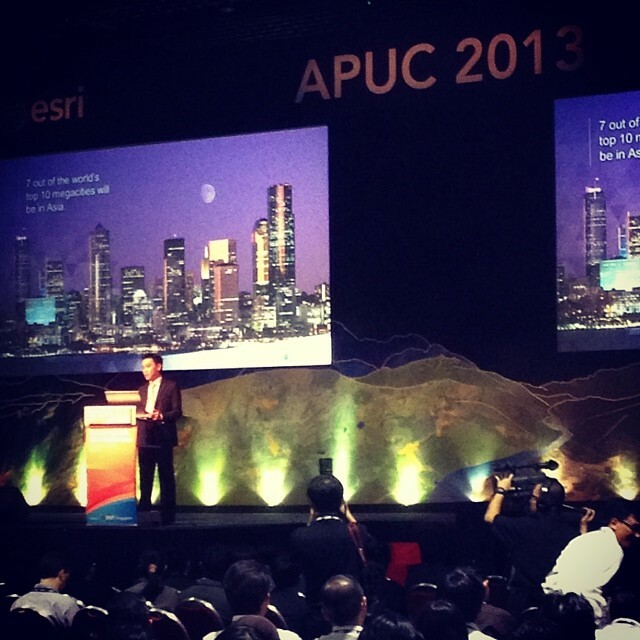 Good APUC 2013 event summary from Alicia/Esri Australia.